nasal bot and itchmite in sheep. • No clean paddocks are available i.e. those with minimal worm burdens. • With pre-lambing ewes towards the end of pregnancy to avoid handling. mis-mothering if lambs are already on the ground. If long-acting drenches are being used, it is vital they are used responsibly. Note: Capsules play a very similar role to LA drenches and they should also be used responsibly. • The irresponsible use of LA products may render that class of actives ineffective on that property. This means that not only the moxidectin in Sheepguard LA will be at risk, but also the other MLs. – sheep seeding paddocks with resistant worms. 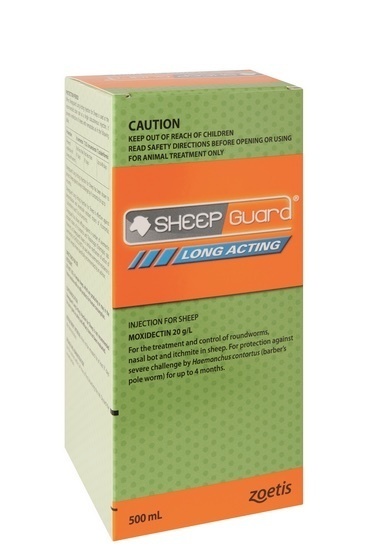 • Accelerated drench resistance emerging due to sub-lethal levels of the LA active in the sheep. pole worm for up to 4 months. the skin, subcutaneously, not into the muscle tissue. injected on the opposite side of the neck. 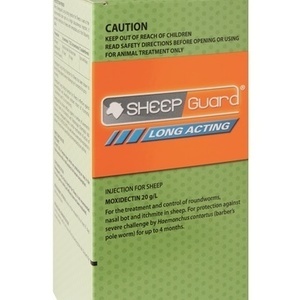 • Sheepguard LA has a shelf life from 3 years. milk or milk products for human consumption. first use of the product. • Dose rate is 1mL per 20kg liveweight.